Tyler and Sarah Stewart of TortoiseSupply.com. After growing up chasing lizards in the deserts through the late '80s and early '90s, I started keeping and breeding jacksons, veiled and "blue" panther chameleons in 2001 on a small scale as "Bluebeast Reptile." Things slowly expanded through 2003, and by 2004, I was producing a surprising amount of chameleons monthly in a few different species. Almost out of luck, I turned out to be pretty good at what I was doing with these exotic and fragile creatures. I was heavily involved in the chameleon market through late 2007 when a few factors forced me to redirect my reptile addiction. More than anything, I was working many hours in my normal job, on top of being a single dad from a previous marriage, that I didn’t have the proper time to care for the 200+ chameleons I had on hand at any given time. With all the cage cleaning, cricket care and everything else that comes with it, I was stretched thin for time, and started to feel some chameleon burnout coming on (as anyone with multiple chameleons knows, it's a lot of work). After getting married in early 2008, I managed to drag my new wife, Sarah, into this business with me, put all of the effort into the tortoises and weaned ourselves off of the chameleons that I had kept for so many years. I always had many of the tortoises running around, just never put the entire focus on them until that point. It's been refreshing to start something new, market something different and make a whole new set of friends in the industry while maintaining the old ones. Because of a good, established reputation in the reptile world, we kept the name "Bluebeast Reptile" after the switch to tortoises, and in 2010, we slowly transitioned over to "Tortoise Supply." Tortoises have been much easier for us to handle being in the desert of Las Vegas, and it offers us more time to spend afternoons together as a family, and to be able to get out of town when we need a vacation. Since nothing in the tortoise world happens very fast, we are young and patient, so we will be just fine. Sarah and I were both born and raised in Northwest Las Vegas, and live here still. We have known each other since we were kids, but didn't date until a few years after college. We both come from large families, and spend much of our free time with them both here in Las Vegas and in parts of Utah. We love to go RVing with several other similar life-staged families on a regular basis all over Utah, Nevada, California, and Idaho. 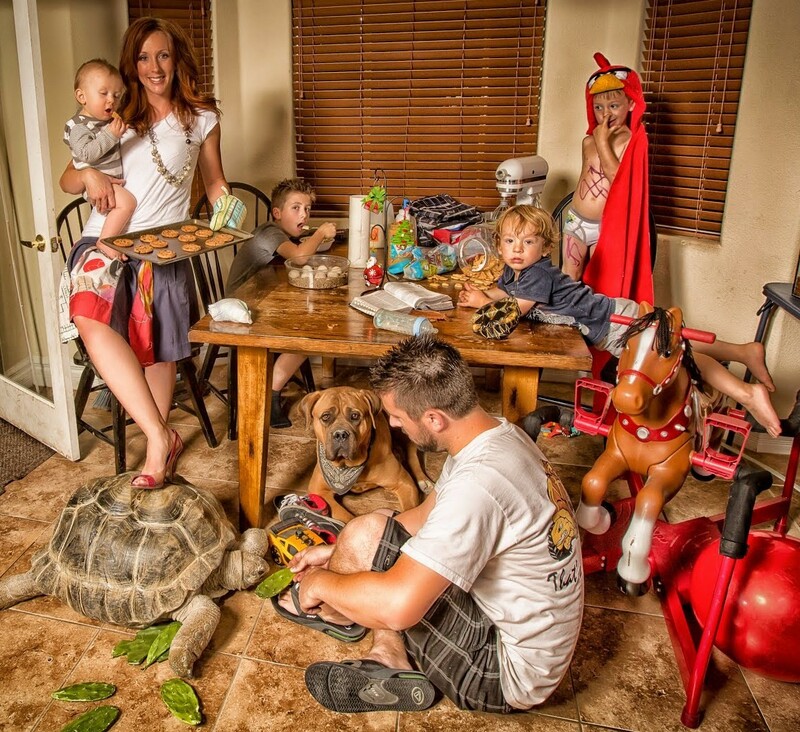 Sarah is a hairdresser part time, tortoise caretaker full time, and full time mom with our 6 wild boys, and is definitely the foundation of our family. She handles the phone calls we get from tortoise customers and does the majority of the packing and shipping. Hunter, my sixteen year old son, is in tenth grade and is a good helper with the animals here. We share him with his mom, but he is very helpful with animals and little brothers here, and every one of them wants to be just like him when they grow up. Mack, our nine year old, is our "office manager" and helps us gather supplies from various nooks and crannies in the house to pack in shipments. He has become quite the motocross rider and lately has driven some pretty impressive 50 mile trips in a Polaris RZR 570 with a little brother as a co-pilot and navigator. Wyatt is our eight year old daredevil that is always eager to impress. He likes doing tricks on his ATV at the sand dunes. Gage is our six year old monster and carries our shipments from the office to stack them by the front door for the UPS pick-up (one at a time, in about a five minute round trip, usually getting side-tracked on the way back). Dexter is our dimpled four year old blonde boy who melts hearts wherever he goes. On multiple occasions, complete strangers have asked if they could take his picture. He was our third attempt at getting a daughter. The final boy (again, boy) Ridge was born in September 2016 and has been another very easy baby for mom. He has no fear, and will go on any carnival ride or bounce house that his brothers go on without hesitation. He has had a scab or scar on some part of his face since as long as I can remember. All of our boys work hard and are very involved in the tortoise business from packing seeds and herbal hay to pre-assembling shipping boxes. I work day-to-day as a commercial concrete estimator, do most of the care for the adult tortoises, egg laying and incubation, all our website work and e-mails, sideliner beekeeper, and am very active in the local off road side-by-side groups. We also have an alapaha blue blood bulldog (Baz), a bengal cat, crested gecko, and albino gopher snake to complete our family. Dexter exploring Mammoth Cave in Southern Utah. Someone let go of the baby at the top of the dune. We picked him up at the bottom. Amargosa sand dunes, Nevada. Tired boys (Hunter, Ridge and Dexter). Ridge snuck away with mom and dad and gets his own ice cream. Dexter, Gagae and Wyatt at a family reunion in Northern Utah, June 2018. Mack at 8 years old riding at Dumont Sand Dunes in Southern California early 2018. Mack and one of the breeder groups of Russian tortoises. Kids on the way to get pizza in Logandale Nevada after climbing rocks all day. Ridge is ready to ride. Dexter and Ridge by the camp fire. Dexter helping dad water tortoises when it's 115 degrees outside. Mack cutting up a dead pistachio tree for firewood. Mom really slowing down Dexter's action for a pit stop. Mack in central Utah, face paint to match riding gear. Dexter, Sarah, Tyler and Ridge at the Idaho sand dunes July 2018.